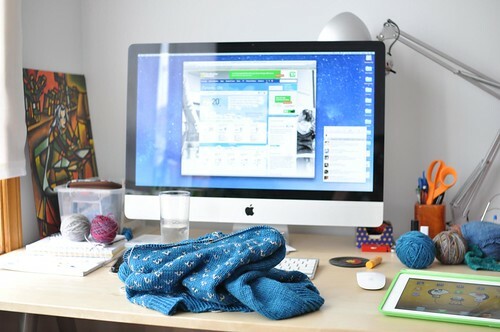 Kim asked in her latest blog post to see desks without any tidying or styling. Why not? Here’s mine! – The painting in the corner was a gift from a good friend in high school. I still haven’t had it framed or anything but I’m hoping to finally do that soon! – I use Yorufukurou for my Twitter desktop client and I love it. – There is a lot of yarn on my desk. – My iPad wallpaper is Jake from Adventure Time. He’s the best. Also, I’ve been playing HayDay – the shifty-eyed sheep are great, but beware, this game will take up a lot of time! – That glass of water should really be on the coaster. 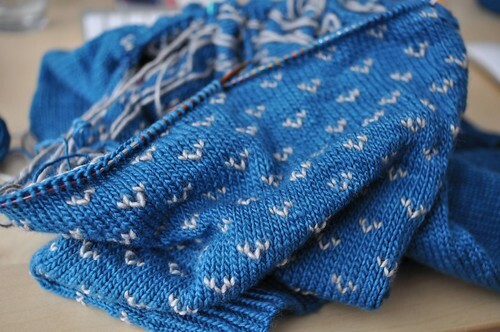 After a bit of a break, I’m back knitting on Sheepcote – I’m on the yoke and it’s coming along nicely, but I only have one skein of yarn left! Will I make it? We’ll see. I might have to change it to a v-neck to use less yarn. My desk at home is spotless, but I have one of the Ikea desks that with the book shelf, so everything is in the cubbies including my laptop, a sewing machine, a loom and yarn and fabric. It still looks so civilized! Wow–so tidy! I was all pleased about cleaning off my desk, but now I think I need to give it another pass! My desk tidied up doesn’t look that neat! I’m hoping it’s more a storage issue than representative of a cluttered mind. I don’t know what surface space is. I can’t relate to your untidied ;) but I am envious. The sweater looks great in those colors. I really like the pattern, but it’s a bit out of my comfort zone. Maybe one day, lovely design!